The volume of information about luminosity masks and selections is a bit overwhelming . . . and I’ll admit that I’m part of the problem. I’ve written several blogs and tutorials about various luminosity mask/selection techniques, different ways to create and use them, and little tricks that I find helpful; and there are plenty other sources scattered across the Internet. It can be hard to know where to begin to actually start using them. The goal of this article is to review some basic concepts about luminosity masks and selections and to compartmentalize the various techniques so that users can more easily decide how apply these methods to their photographs. The first thing to review is the difference between a mask and a selection. A “selection” usually has marching ants over the image enclosing the selected pixels. Whatever you do to the image, the selection determines which pixels experience the effect and to what degree. Selected pixels are affected by the action; unselected pixels are not. A “mask” is how Photoshop saves a selection. In the mask, selected pixels are white, unselected pixels are black, and partially selected pixels are gray. 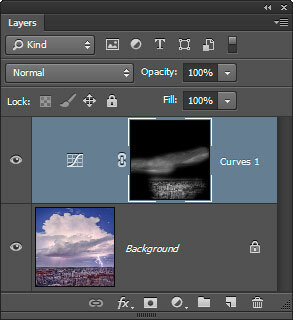 A mask on an adjustment layer is called a layer mask, and does exactly the same thing as a selection. The lighter a pixel’s tone in the layer mask, the more it feels the layer’s adjustment. White pixels get 100% of the adjustment. Black pixels get none. Gray pixels experience an intermediate adjustment. The left image below shows a luminosity selection with the marching ants. The corresponding mask of this selection is on the right. The terms “mask” and “selection” are frequently used interchangeably. For this article, however, I will use “mask/selection” when the statement is accurate for both masks and selections, and use “mask” or “selection” when there is a need to be specific. 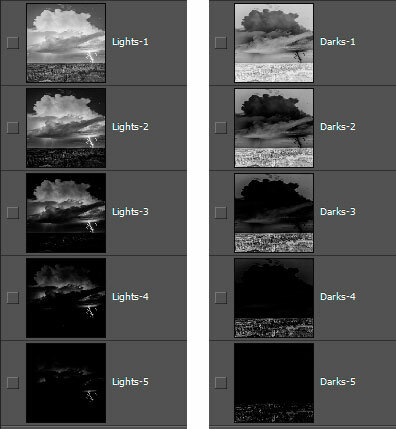 There are ONLY two (2) series of primary luminosity masks/selections: Lights and Darks. The masks of the selections are shown below. While there is an entire spectrum of possible luminosity masks/selections, there are still only two primary series: Lights and Darks. “Midtone,” “subtracted,” and “zone” masks/selections are NOT primary luminosity masks/selections. They are secondary masks/selections derived from the two primary series. The primary series only includes the Lights and the Darks. The Lights-series selects progressively lighter tones in the image and the Darks-series selects progressively darker tones. All the Light-series masks/selections are “anchored” in the very lightest tones in the image, meaning that the lightest tones are the most selected tones and will appear white in the mask. The Darks-series is anchored in the darkest tones. The darkest tones in the image are the most selected in the Darks-series and will appear as white in the mask of a Darks-series selection. This can easily be seen in the images of the two series of masks above. A luminosity workflow is not based on a prescribed series of steps that are repeated with every image. Instead, the photographer evaluates the image on an ongoing basis and determines what adjustments the image requires as it develops. Step 1−Decide what needs to be done. Look at the image and figure out what it needs. If it’s a brightness or contrast issue or if specific tones need to be adjusted for color or saturation, a luminosity mask/selection often provides a useful approach. Step 2−Choose the correct luminosity mask/selection. Start with a primary mask as it separates the tones into Lights and Darks (and it’s usually pretty easy to make that decision). However, if the tonal range for adjustment is a midtone and not anchored in either the blacks or whites, start thinking about a midtone, zone, or subtracted mask/selection (see Method # 4 below). To help make this decisions, the “View” buttons on the new panel make it easy see what areas are selected. The image below shows the Lights-3 selection and the corresponding “View” mode equivalent that has a red mask over the selected pixels. Step 3−Choose a method for adjustment from the options listed below. There are surprisingly few. While there seems to be a confusing number of ways to use luminosity masks/selections when developing an image, they mostly fall into just four (4) categories. 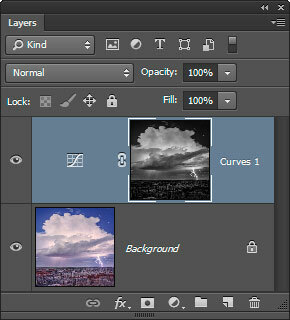 Method #1−Use a luminosity mask on an adjustment layer. This is the classic way to use a selection−make a mask of the selection on an adjustment layer, and then let the mask filter the adjustment to the correct parts of the image. An adjustment layer is usually a good way to make a more general or global adjustment. Even though a luminosity mask filters the adjustment to specific tones, the natural feathering of luminosity masks/selections allows the adjustment to spread beyond the confines of the selection’s marching ants. So when looking for a broader effect, a luminosity mask on an adjustment layer, like that shown below, is worth considering. Method #2−Paint through an active luminosity selection onto a pixel layer. Luminosity painting with black and white paint is the best example of this, and, in contrast to an adjustment layer, provides a high degree of precision. Not only can lightening and darkening be brushed onto an image exactly here it’s needed, but repeated brush strokes can further increase the effect. So if precision and control are the goals, painting through a luminosity selection onto a pixel layer, like in the image below, is the best approach. Method #3−Paint through an active luminosity selection onto a layer mask. Exposure blending is one example of using this method where a layer mask is painted white or black through a luminosity selection in order to reveal or conceal tones on the current layer. The Hand-Blending HDR tutorial talks about this, but there are several YouTube videos and other tutorials on the Internet that demonstrate this technique (like this one). It’s also possible to use this method to paint in an adjustment to specific tones on an adjustment layer as in the image below. The Painted Masks tutorial discusses this. Method #4−Combine various primary luminosity masks/selections to make new (secondary) luminosity masks/selections. While this is not actually a method to adjust an image, it’s still a very important way to use the primary masks/selections. Midtone, zone, and subtracted masks/selection are all created by this method. These secondary masks are incredibly useful as they allow targeting tones that aren’t anchored in the image’s blacks and whites the way the Darks- and Lights-series are. Often, it’s actually best to create an appropriate secondary mask/selection from the primary masks/selections before employing one of the first three methods to actually make an adjustment. The left image below shows a Lights-1 minus Lights-3 selection. The subtracted mask of this subtracted selection is shown on the right. Thinking about using luminosity masks/selections in just one of these four ways makes the decision on how to accomplish a particular adjustment easier as it narrows the possibilities. In fact, sometimes the adjustment method will be ore obvious than the mask/selection. For example, if precise burning and dodging is the goal, then luminosity painting (Method #2) is the method of choice and it’s just necessary to find the best selection to paint through. Or if a large tonal area is going to be adjusted, then a luminosity mask on an adjustment layer (Method #1) might be the logical approach. So with the method decided, it’s just necessary to find the right mask/selection to target the desired tones and the “View” buttons can help. While there are additional Photoshop techniques that can be employed with luminosity masks, they are mostly variations on the methods listed above. For example, the Edit > Fill command could be used instead of painting with a paintbrush, though painting provides much finer control. But don’t get too fancy to begin with. Using luminosity masks is sort of like learning to play a musical instrument. First learn to play the basic notes and before long you’ll see how to combine these into a melodic piece. Similarly, once you’re familiar with the basic processes for luminosity masks, you’ll be able to start using them with increased confidence to achieve the desired results. Nice article, Tony. Oh, and great image!! Very nice, Tony. But with Sean Bagshaw’s videos, it was fairly clear….just takes a lot of practice! Thank you for this… I’ve been overwhelmed with all of the tutorials I purchased from you. This is great. Could you extrapolate on the use of edit/fill instead of painting? I was with you until that point. For both pixel layers and for layer masks on adjustment layers, the Edit > Fill command can add black or white paint at varying degrees of opacity. So, instead of painting in black and white with a paint brush (like what’s normally done with luminosity masks/selections), you could just dump it in with the Edit > Fill command. But that’s certainly less precise than using a paintbrush. It’s just meant to illustrate that there are different approaches to implementing image changes with luminosity masks beyond the basics discussed in this article. Thank you Tony. Attacks of simplicity are always welcome! Thanks Tony. Using your actions and working more and more with luminosity masks has made it possible for me to greatly upgrade post production work on my pictures with much better results. Really appreciate the work you have put into this. I am putting it to good use! There are different opinions on this but I do set sharpening to zero in LR/ACR so that RAW conversion doesn’t contribute to overall sharpness. I do this on the theory that some adjustments that I do in PS will increase contrast and any contrast increase can also increase sharpness since sharpness is essentially increased edge contrast. I prefer to save all sharpening for the end, and this includes excluding the bit of “pre-sharpening” that LR/ACR applies with default “25/1/25” setting. 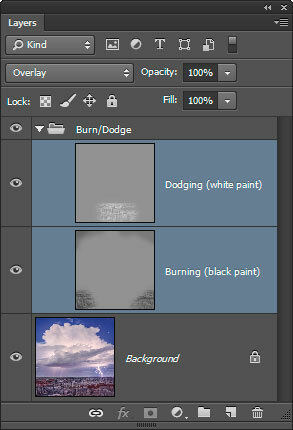 For web-sharpening using the actions, I usually choose a custom layer opacity for each image. The image and it’s elements, the camera/lens settings that were used, and the amount of processing applied are just some of the variables that will affect how sharp the image looks after the standard sharpening provided by the actions. So making a judgement as to the desired sharpness by adjusting the opacity is part of my workflow too. I will also on occasion mask off the sharpening on certain parts of the image completely when that’s what’s called for in a particular situation. If there is a standard opacity decrease that works for all images, it could recorded into one of the programmable buttons on the panel. Thank you,Tony. You and your eruditions about masks/selections always make working in PS pleasurable and successful.